Whether you’re developing a new course or redesigning an existing one, the Center for Teaching and Learning's (CTL) instructional designers are here to support all your course development needs. 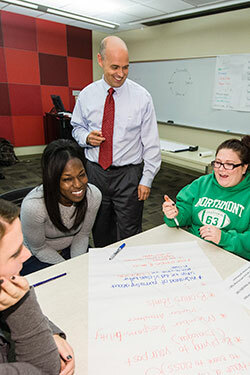 Through one-on-one consultations or timely, innovative workshops, the instructional design team can offer guidance on creating effective learning activities, assessment strategies, course management techniques, and best practice course design that will meet the needs of your students, course goals, and performance objectives. All of our instructional designers are Quality Matters and QM Peer Reviewer certified. And if you need help integrating your course into Pilot, the university’s learning management system (LMS), the instructional design team, along with our dedicated LMS technologist, will help you navigate it with confidence. So, if you are seeking engaging classroom activities, need guidance in developing a syllabus, or want to create a new hybrid or distance learning course, the instructional design team in the CTL is there to help. If you can dream it, we can help make it happen.